As one of the key components for GPON FTTx networks, optical splitters can be placed in the Central Office or in one of the distribution points (outdoor or indoor) because the FBT splitters are highly stable for multiport optical signal splitting with low insertion loss. FBT couplers are designed for power splitting and tapping in telecommunication equipment, CATV network, and test equipment. In response to the rapid increase in requirements for passive optical networks (PON), Fiber-Mart now provides a new All Band FBT Couplers Splitters. All Band coupler (ABC) is built by Special technique. The operating bandwidth of the coupler is expanded to 1260-1620nm, and with low excess loss and low PDL. 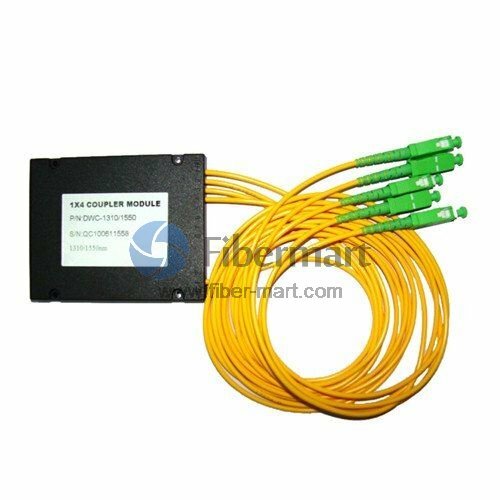 1x4 All Band Coupler ABS Box FBT Couplers Splitter can splitter the optical signals into 4 parts, and the coupling ratio can be customized. b. Wide wavelength range of 1260nm to 1620nm can be selected. c. 1x2, 1x3, 1x4 configurations of splitters are available. d. 250um bare fiber, 0.9 loose tube, 2. 0mm or 3.0mm LSZH fiber cables can be selected. Welcome to contact us for customized solutions. Fiber-Mart offers cost-effective standards-based 1x4 All Band Coupler ABS Box FBT Couplers Splitter. 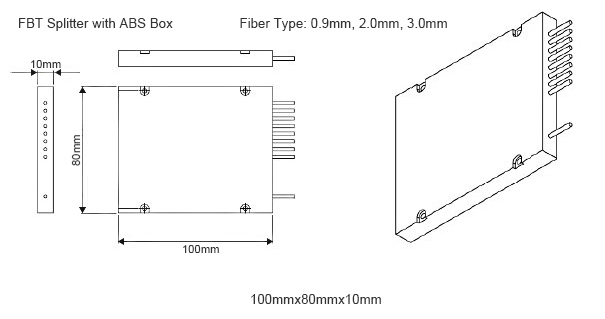 As a 3rd party OEM manufacturer, our 1x4 All Band Coupler ABS Box FBT Couplers Splitter is delivered to worldwide from our factory directly, and they are all based on thin film filter technology and metal bonding micro optics packaging. What's more, 1x4 All Band Coupler ABS Box FBT Couplers Splitter are tested in-house prior to shipment to guarantee that they will arrive in perfect physical and working condition. Please contact us at [email protected] if you want to know more details.